I've been waiting for a good time to do a giveaway of these two books and this is the perfect opportunity. Since it's Urban Homesteading Giveaway Week, today's items up for grabs are the two, wonderfully pictographic books by Ashley English. As part of the Homemade Living series from Lark Books, they are a great way to start your library of homesteading books or add to it. 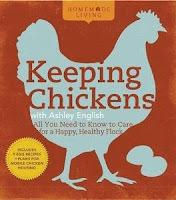 The first book, Keeping Chickens with Ashley English, includes detailed information from selecting a breed to where to get them, housing options, feeding, health, hatching and raising chicks and recipes. 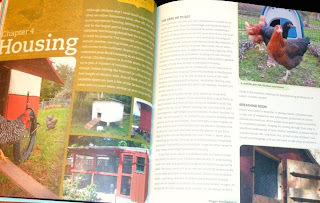 This book also includes profiles of people who have taken on the chicken-rearing challenge as well as two projects with exploded woodworking illustrations and photos: a simple nesting box and a mobile chicken tractor. The second book, Canning & Preserving with Ashley English: All You Need to Know to Make Jams, Jellies, Pickles, Chutneys & More, will inspire you to begin canning and, if you are already a canning queen (or king), get you champing at the bit in anticipation for this year's harvest. Topics include necessary tools, canning basics, safety and ingredients as well as recipes for, well, jams, jellies, pickles, chutneys and more. 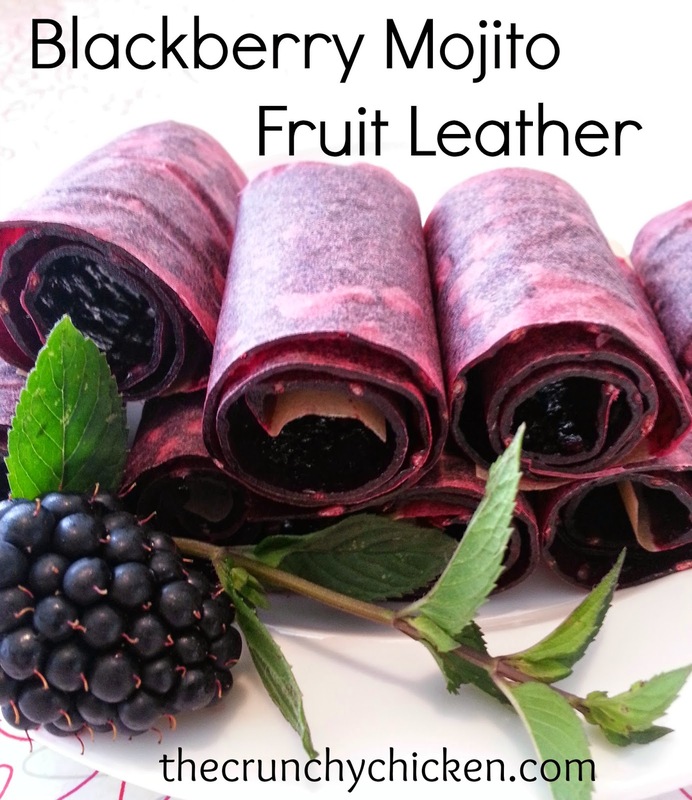 She wraps it up with seasonal recipes like Fig and Thyme Jam, Beet and Sage Relish and Rhubarb and Amaretto Chutney. 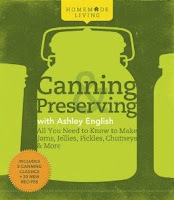 Ashley will help take the fear out of canning for newbies and give new spark to recipes for seasoned canners. If you are interested in entering the random drawing for these two books, please add your name to the comments of this post. You have until midnight PST this Friday, February 25th to enter. This giveaway is open to U.S. residents only. Good luck! Make sure you check out Sunday's post where you can enter to win a swanky looking rain barrel I'm giving away. These books sound awesome. I hope I win! betsy (at) eco-novice (dot) com. Chickens and Canning! Yes, please! I love canning, and am always looking for better and new ways to do so! Thanks for the giveaway!! I could use a new canning book, and a Keeping Chickens book would be great to give to my new to chickens friend...sign me up. My very favorite canning experience was four summers ago, when my husband & I discovered an urban feral grape vine in the back of an abandon house. It had twined itself over a fence & small building, and was taking over a serious tangle of blackberry and long-neglected apple trees in the right-of-way. The grapes were green, ripened all at once, and we picked bushes and bushels of them. I processed them all in two days - and they had seeds! Two each. We made grape jelly, and it was soooo good. We gave nearly all of it away for Winter Solstice gifts. We've gone back every summer since then to harvest them. Then, sadly, someone moved into the house and tore out all the wildness... the day we went looking for grapes and found severed vines and dead unripe grapes actually broke my heart... it was such a beautiful life form, and the good folks who moved into that humble house probably had no idea what they were taking down. I'm always on the lookout for feral fruit! Seattle has lots - and I'm excited about another canning season... but please, can we just have spring soon? Those books look gorgeous.....pick me pick me!!! I have dreamed of raising chickens, and have made many a batch of organic jelly. Would love to learn how to raise chickens. I would love these books! Please enter me in the drawing :). Those both look like lovely books! I've popped over from the Take Back Urban Home-steading page on FB. This is a great giveaway! I could use a canning book, hoping to get enough out of the garden this year to can. The chicken book would be wonderful for when I get chickens in a bit. Sounds great! I would especially love the canning book! I'm always looking for new recipes! Chickens and canning, oh my! LOVE it! I am looking to expand my horizons so these books sound like just the ticket. Thank you! I asked for chickens for my birthday, so this book would be handy (not sure how I will do with the chickens, so I could use the canning book as back up - love to cook!). I have paged through both of these at the bookstore and they are beautiful! I would love to win. Have recently moved my three city chickens to the country to give them a proper garden to feast on... along with their 20 friends that are on the way! Enter me w/ urban homestead love!! OOooo I could really use those! I could use both of the books especially the canning and preserving one! Thanks for another great give away! Just discovered this blog. Please include me in the drawing! They look like great books! I can't keep chickens yet, but hope to someday. :) Thanks for a great blog! I remember being excited by a review of the canning and preserving book. Sign me up! Fantastic - these books look wonderful (and have been on my wish list for rather a long time now). Please count me in too! I have plans to raise chickens and hopefully get some new zoning laws in my suburban neighborhood on keeping them. There has been talk about homesteaders being zoned "microfarm" in the urban & suburban areas near me in order to bypass the laws. Thanks for all your inspiration. Ooo, pick me. We're thinking about getting chickens this spring. This would be a fabulous addition. I would love both books! Thanks for the chance to win. I would love to win. I could always use another book on homesteading! I SO badly want to learn to can, and any extra info I can get about raising my lovely hens would be a treat!! Thanks for the giveaway. We're thinking about trying to squeeze in some chickens, so I'd love that book! Honestly, I have enough other canning books so I'll pass on that to give others the opportunity to learn to can. Both are topics we have decided to begin soon! The books would be helpful...thanks! These would be great in my library. Great books! And if I don't win the giveaway, I'll plan on checking them out at the library. Thanks Crunchy! Fun books! We met some friends at church who keep chickens and we always buy eggs from them when they have a surplus. Two other friends (one long distance) have also started keeping chickens so I have been considering it myself since we have a huge yard. My wife has fond memories of helping her mother with the annual apple picking and applesauce canning along with other seasonal fruits. I love both my chickens and canning! I have been looking for a good canning book, this one looks great. Glad to have found your blog this weekend. Guess something good did come out of the whole TM fiasco. Either of these books would be great! We have chickens and love to can! Heck yes, I'd love to win these books!! Nice choice. I'm interested in both topics. This is my first year attempting to begin homesteading (with a passion). Thanks for the offer. hey, thanks for yet another chance to win...always looking for new reading/new ideas! Great books and both are on my list to purchase so *fingers.crossed*! How cool! I am always looking to add more books to the "homestead" library. We are going to be getting chickens as soon as we can and this would be a great resource! These books look wonderful. I love to can and so this would be icing on the cake for me! Oh I need this... getting land on whidbey and clueless about canning and chickens, but know they are in my future.... pick me pick me! Thank you for your time and effort that takes to share a part of yourself in such a wonderful blog. I feel as if reading this blog and others is like learning the skills my Grandmother would have taught if she had not passed. Thank you for helping me become a more well rounded empowered woman. Please, oh please, oh please!!! Pick me!! We are moving abroad soon and I want to raise chickens and expand my garden to help support ourselves! I'd love to win these books! Thanks. chickens and canning - two of my new year's resolutions to get started on this year! Thanks for the opportunity! Mmm, fresh eggs and home-canned goodness. I am feeling lucky! I would love to expand my homesteading library. Thanks for the giveaway! Both books look great! Please enter me in the giveaway and thanx for doing it. as a practicing novice at both chickens and canning, these would be amazing books win! Oooh, we are thinking of taking the plunge on chickens in the next month or so. I'd love those books. Two of my very favorite things! It's been so fun to read all these blogs!! I would love these books!!!! I hope I win, I hope I win. Thanks for the great book giveaway!!! I'd love the canning book! I'm a novice when it comes to chicken, though I'm planning on getting some very soon, so this would be perfect. When it comes to canning, my title is She Who Cans. I'd love to get my hands on some of those fancy recipes though, mine tends to the simpler end of the spectrum. Too bad about not being able to enter (Canadian) but thanks for the great titles. oooh! Lovely books! Pick me! pick me! Ooooh, sign me up, please! I would love the canning book. It's something I want to learn, but it seems so daunting. Ooooh I'm wearing hubby down on the whole chicken thing. This book could help the cause. chickens & canning - two things I intended to learn about this summer anyway! Canning is on my list of things to learn that just seem overwhelmingly intimidating. Would love to win the book! That canning book looks gorgeous! Fantastic! I've always wanted to have chickens. OH gosh, I really want the book on canning....and hey, I have been thinking about chickens all winter. Chris in Montana would love to win. Please count me in for a chance to win. And thanks for the chance! I am very interested! I'm hoping to add chickens to my set up next Spring! I've noticed both of those books before and would love to kick my meager skills up a notch with some expert advice! That cover art is awesome. I would love these books! Not quite a rain barrel, but another really awesome giveaway! :-) Thanks for the chance!! Would love the canning book. Have been keepin' chickens for six years now. Couldn't do without 'em. I'm trying to teach myself how to can & have almost convinced my husband to let me keep some chickens. I could sure use some instruction! I've been eyeing Keep Chickens for a while, and I'd love a new canning book to add to my always growing cookbook collection! What great giveaways you're having - I would love to have either of these books. Thanks for the opportunities! We keep talking about getting chickens so the book would be great to win and I've been canning more and more since our garden gets larger each year. Pick me! I would soooo love to win the canning book - have been wanting to start canning but feel I have a lot to learn before I can do it properly. We've been talking about getting chickens and I've been canning more and more since our garden gets larger each year. Pick me! I need help with both of these things! Ashley rocks and the books are great! Sounds like some good reading! Oh please count me in! Love your blog! new page design looks great! book with chickens, also great! The books look great. I will be getting baby chickens mid March. Fantastic idea. I love chickens and canning. I love these book so so much! I am in love with Ashley English and her Small Measures blog! I am just starting out with canning and preserving, and someday hope to have my own backyard chickens! I love Ashley...big fan of her blog and her Design*Sponge column. I would love a chance to win her books! I already raise chickens, but I want to get into bees next! i've been meaning to start canning for some time now. Using this book would be a great place to start! Please enter me into the drawing. I have been casting a covetous eye on both of those books. Chickens and home canning are my passions. I'm planning to start canning this summer in Brooklyn- would love some tips! Please include me in the drawing. :) Thanks! For sure! My hubby and I have just recently been talking about getting chickens. Fresh eggs, yum!! Love you blog! The books look wonderful. I love Ashley's Keeping Bees book. I would really love to check out these, too! Such a great series of books - it would be lovely to have a copy of my own! Yes, please! I would love the canning book and (as I'm in an apartment) I know just to whom I'd lend the chicken book until we are in a house! OOOOH! I am dying to start canning! I would love to win these. Thanks! These look like amazing books that I could really use to start canning. That canning book looks great! winning these would help me cross them off my amazon wishlist! The canning book looks awesome! Oh, I would love the canning book. Both of them, actually, they look fantastic! I'm a big fan of these books. I love the photography. I can't wait to pick up the two newer books at the library! ohhh i have been eyeing up these books for a while! thanks for the giveaway! I would love these books! Thanks! I would love these books! I just started beekeeping last spring and canned jelly for the first time last summer. It would be great to have them as resources! Oh, I'd love to have the Chicken book!! I would love either books, but especially the Chicken book. Great giveaway! Both books look great! I have been dreaming of backyard chickens for a while now... Thanks so much! I would love to win these books. Trying to do more canning & preserving each year. Ashley's books are awesome! Count me in. Love your site! Please let me win the chicken book!! Fingers crossed! Hoping to win the keeping chickens book. Please enter me in the giveaway. We started raising chickens over the summer and this book would come in handy. I would love to win these! I've been dying to read them! My husband got me the preserving book for Christmas and I must say, great read! Can't wait to try some of the recipes. we are looking forward to getting some chicks in the near future. would be a great book to read! I need to learn all I can about chickens and canning when we move into our new place. Fun things in our future. I need you to come and convince my husband that we need chickens. I think I'm caught up now... thanks for offering such great giveaways! 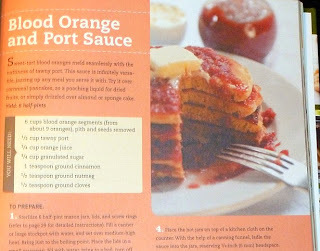 My local library actually has the canning book and I checked it out recently to see what it had to offer and the recipes look pretty awesome. I could use some more reading material. . .
Love that chicken book, I've taken it out of the library many times. Didn't know she had a canning book too, fabulous! I will have to work on my librarian to get that one as well. That would be great! Both books have been on my wish list for a while. I would love to have my own copies of these books.